Ivea Mark, a Calgary piano teacher, pianist and organist, liked her first pair of progressives, but not her second. "My first optometrist went to great lengths to find out all my daily needs in order to fit the lenses," she shared. Sadly, that optometrist is no longer available. "The second person did no such thing," she continued. "One question was asked: do you want to see further or closer? And that was it. I now have problems seeing things up close, like reading. Everything is done at arm's length. My peripheral is also limited with this new lens but not in the old pair." Another piano teacher hates her progressives. In her words: "They limit my field of vision too much and were a complete waste of money." Gwendolyn Richardson Bartek, a piano teacher from Wembley, Alberta, had some hopeful feedback: "I have progressives that are called "office" glasses - They are wonderful. 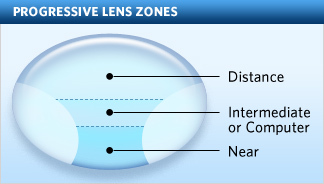 Most of the lens is intermediate range. They are originally designed for working at desks with computer terminals. They have multiple levels, so you can see anything from up close to about 10 feet away just by changing the angle you are looking at it with. I LOVE them!" One member from choir wrote, "I've had progressives since I started taking piano lessons and have always had trouble reading the music. Also, because I work so much on a computer, I've been told that I should have a different Rx for my screen work, which, to my mind is much the same thing." (Addendum) Another piano teacher writes, "I have progressives as well. I find they're useless for reading music and for teaching. I need to use single vision glasses for reading music and another pair of single vision glasses for teaching, seeing my students hands etc." (Addendum) My colleague, Dan Starr in Arizona told me that he juggles between three pairs of glasses. He happens to teach piano to his optometrist, so his optometrist had a keen understanding of Dan's needs. (Addendum) One of my university buddies (a piano accompanist) told me that his optometrist recommended just digging out an older (weaker) prescription to use as reading classes. I have since found my glasses from six years ago. I can report that threading a needle is a piece of cake with my old glasses on. I've saved the best tidbit for last. One of the ladies who used to play piano in our choir is a licensed optician. She said, "In my professional opinion you are correct," (as far as using standard and short-corridor progressives to read and play music). However, she does mention a different type of progressive lens, called Home & Office by NIKON. "This lens has wide intermediate and reading with a small distance portion...It wouldn't work as your only pair of glasses but it should work in the musical world." Really, what it's coming down to is that office progressives are a more suitable choice for musicians. However, at this point, I don't even know if I can even stomach any type of progressive. Literally. When I bought more Gravol today, I took a close look (with my intermediate range vision) at the dosage instructions on the box. It says not to exceed six lozenges a day. Since I've started taking the Gravol at 4:38 AM Saturday morning, I've polished off a box of 20. That's 10 a day, not including the two drowsy Gravol pills I took before bed. Something is definitely wrong with this picture. These were today's goals for my progressive glasses: Time Length Goal: 6 hours minimum Time Length Progressives Worn: 12:23 PM - 8ish PM (almost or just about 8 hours). Tasks: Chores, driving, studio-related errands, cooking and eating, computer work Part of the Lenses Used: 49% Intermediate distance, 49% Long Distance, 2% Near "Fine-Print" Distance (accidental) Progressives and chores aren't too bad. Better than Day 3. Wearing progressives while driving, however, was challenging. Shoulder checking and turns were difficult. For someone who relies on her peripheral vision extensively for musical and non-musical tasks, the distortion in those areas is aggravating. I will try again after I have several days of "mostly progressives" days, which will start...tomorrow. I'm not sure if I'll be able to wear them for more than 12 hours, but I'll try. Our choir director has given the go-ahead to film a small part of this week's rehearsal with and without progressives for the experiment. I'm so glad I spoke to my father about progressives. His pair sounds more do-able by each passing non-nauseated second. Not sure how well they'd work for music and driving, though. I'm also curious as to how professional athletes deal with this issue. I imagine their vision focus needs are similar to musicians. Feelings and Symptoms Felt: Fine for the first three hours. A mild headache in the occipital lobe area, which gradually spread across my entire head in a circle as it increased in intensity. It was worst above my eyes. Nausea worsened while driving and reached the point of wanting to assume the fetal position and cry or run for the nearest washroom. This is the entry that I know many of my music friends have been anticipating: musicians working (or trying to) with progressive lenses on. Continuing from where I left off with my "progressives experience" for Day 3 - Part 1, I decided to try doing some office work while wearing them. Then, I figured I might as well try practicing piano too. Cluttered as my office is, I do like my office set-up. My computer screen is 22" and I sit back on on an ergonomic chair. I use a stylus instead of a mouse to avoid tendinitis. I can enlarge the text size at will and basically read everything "head-on". This applies to reading papers and my smart phone. I found that I used the top two areas of my progressives when doing my office work without any challenges. I was hard pressed to find an example of reading with the bottom part of the lens. By this time, I was subconsciously avoiding the bottom part of the lens since I knew I wouldn't need it for my tasks. If you get too frustrated watching the video, you can skip towards the end to go through the last song (with and without progressives) and where I give my feedback. Last night, I said that as far as playing a musical instrument goes, standard progressives and short corridor progressives truly are useless. However, I was speaking with the guitarist in my choir about it this morning and he said he had no challenges using progressives to read music. Willy doesn't need to use his peripheral vision to look down and to the sides. As a pianist, singer, conductor and percussionist - I do. Therefore, I think that whether progressives work for musicians really depends upon the instrument and your playing situation. Due to the nature of my playing needs and requirements, I'd have to say that I definitely cannot use standard or short-corridor progressives to read my music and play successfully in an ensemble. I think that any other musician who requires their peripheral vision in the lower and region of the lenses will have a similar experience as I. The vision needs for the lower part of the lens is the same as the middle. I also firmly believe that I have the wrong type of progressive lenses. I feel computer progressives or custom progressives would suit my needs better. By custom, I mean, give me what I do need help with: intermediate and distance vision only. My up-close vision for that fine print is fine. Seriously, I can just take off my glasses and use my own optical power to read the fine print. I can use my pinhole glasses to strengthen my eyes for this. However, neither option were offered to me, which I feel cheated on. I wish that I had been given all of the options before plunking down my non-refundable $900+. I also think optometrists should get their their patients to complete a vision usage questionnaire before choosing which type of progressives to prescribe. I will continue with the experiment until the end of the week and will include teaching, an excerpt of a choir rehearsal, singing and driving (as well as more practicing). However, that last video pretty much sums up why my colleagues have fought (hard) for either multiple pairs of glasses, non-adapt eyeglasses (basic single-vision lens) or dedicated music glasses. Music colleagues: I invite you now to share some of your experiences while using progressives for music. Conclusion: Standard and short-corridor progressives are useless for musicians with vision needs similar to a pianist, percussionist, singer and conductor. They should explore other options, be it a different type of progressive lens (read: computer progressives or custom), multiple pairs of glasses for near, intermediate and far distances or stick to non-adapt single-vision wear. Addendum: I just learned that my father has progressives that have distance vision and intermediate vision only. No up-close reading vision. He relies on his own optical power (sans glasses) for up-close reading. This, I might be able to live with. Furthermore, it should be the first option that is offered to a musician. This will be done in two parts. This is from the first half of my day. I had trouble staying asleep last night, thanks to the nausea. Thankfully, I discovered that I still had Gravol in the house. While waiting for the feeling to subside, I did do some research. Most people who've had more than one pair of progressives say to wear them for as long as possible to speed up the adjustment process. This coincides with what my optometrist's office said. The second thing I learned was that nausea is normal during this timeframe. However, patients with progressives say that if you're still having trouble after two weeks of "constant wear", you should talk to your optometrist to either get your a different prescription, a different type of progressive lens or to exercise your money back guarantee. To my chagrin, I didn't find out until after I ordered from my optometrist that there I do NOT have a money-back guarantee. I do, however, have a 90-day non-adapt (i.e. normal single-vision wear) clause. I shall continue on my path to doubling my wearing time each day. Feelings and; Symptoms Felt: Mild headache in occipital lobe area, gradually spreading across my entire head in a circle as it increased in intensity. Mild nausea today, which increased. Went from feeling disoriented, to "all right" to downright angry. Part 2 will cover working on the computer and practicing piano with progressives. What's the point of that bottom part for reading? For me, someone who spends 90% of my reading time at the intermediate distance, that bottom "fine print" range at the bottom of the lenses is useless. I have to go out of my way to find things to try reading out of that area of the lens. I'll update this as the day progresses. However, I thought I'd share the play-by-play of my "progressives" experiment so far: Time Length Goal: 1 hour minimum Time Length Progressives Worn: 1:30 PM - 2:57 PM (1 hour 27 min.) Tasks: Cooking and piano teaching Part of the Lenses Used: 90 % Intermediate distance, 10% Distance, 0% Near Symptoms Felt: Like I just got off a roller coaster at Universal Studios with flashing lights - nausea, mild headache in occipital lobe area, which later spread to the temples. Felt irritable by the end of the session. I'll repeat these experiments (and more) with the progressives. My eye doctor says I need progressives. Every musician I know who has them (or has had them) have basically told me that "progressives are useless for music". They have either reverted back to single-vision lenses or use a dedicated pair for reading music. I even found some discussion threads dedicated to progressives and musicians. However, my optometrist is convinced that I should be able to handle it - for ALL situations - including music. Photo from Master Eye Associates. Now, look at the visual range for reading music. Note that this doesn't even include playing in an ensemble. I am fighting a strong bias, so by documenting my journey, I hope to overcome that, as well as to give others an insight on the "progressives and music" experience. The sides of on progressive lenses are essentially "dead" space, which does absolutely nothing for musicians who must rely on peripheral vision extensively and shift their focus very quickly. I should preface this by saying that I am extremely near-sighted with astigmatism. I have "dry eye" syndrome and plugged up tear glands, which may factor into this experiment. However, for the past month, I've been taking lubricating eye drops every 2 - 3 hours, being more diligent about removing my eye make-up, using eye lid wipes daily and either doing an eye wash or hot compress two or more times a day. Let's just say that my tear lubrication hasn't been this good in years. In true science fair form, I will post some "Control" videos, showing how I see with my current (single-vision) glasses.